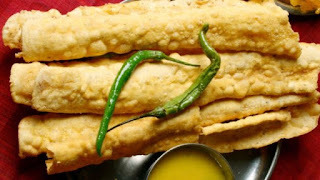 Farsans which can be also termed as snacks or starters as per English language are the delicious gujarati food cusine. This are the food itmes which are made on special occasions for the guests. They are also happily eaten as nashta on normal or regular days with tea or coffee. There are many varieties of farsan which are different in taste . Some are spicy while some are sweet, some are soft while some are crunchy. We are here with the list of Top 5 Gujarati farsaans which you can never dare to miss. 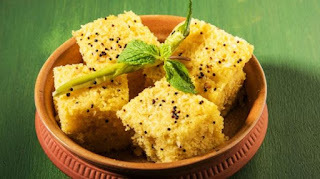 Nylon Dhokla (Khaman): Whenever someone talks about gujarathi food or gujaratis the first things which comes in mind about them are the DHOKLAS. The dhoklas are so soft that they are reffered as Nylon Khaman or Nylon Khaman. Patra: The other most recommended Gujarathi Farsan is Patra.This farsan has the but obvious taste factor but it also has health benefits.Patra is made from the colcocasia leaves in which flavour is added to it which tempts the people to eat it. Khandvi (Dahi Vadi): Khandvi also called as Dahi Vadi is the another delicious Gujarathi Farsan. 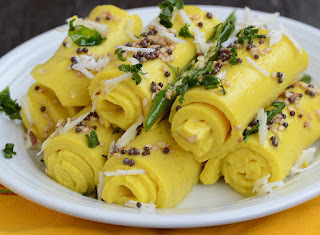 Khandvi which is rolled into different sheets,precisely cut and tempered attractively brings water in your mouth just by the basic beautiful garnishing it requires. Methi Dhebra: This farsan called Methi Dhebra are made from bajri flour and methi leaves (fenugreek leaves) are added in it.This Farsaan is so tasty that if you share this farsan with your friend, there will be no surprise if it gets finish in no time. Fafda: The best Sunday go to food for Gujaratis is this Farsaan. It cannot be a good morning for Gujjus if you don’t have Fafda on Sunday morning.Its a crunchy farsaan.